The social circumstances of people significantly determine the severity of poor outcomes after disasters. The majority of Americans live in cities that face higher risk because of the density of infrastructure, assets, and people, particularly vulnerable populations. I developed the Social Determinants of Vulnerability Framework based on link analysis of the literature to help planners in cities better identify and understand the most vulnerable people in their area. The Framework also provides a way to reduce the likelihood of civil rights violations and poor outcomes for people with limited ability to prepare for, adapt to, and cope with emergencies. The Framework identifies seven interrelated social factors that seem to be driving vulnerability: children, people with disabilities, older adults, chronic and acute medical illness, social isolation, low-to-no income, and people of color. 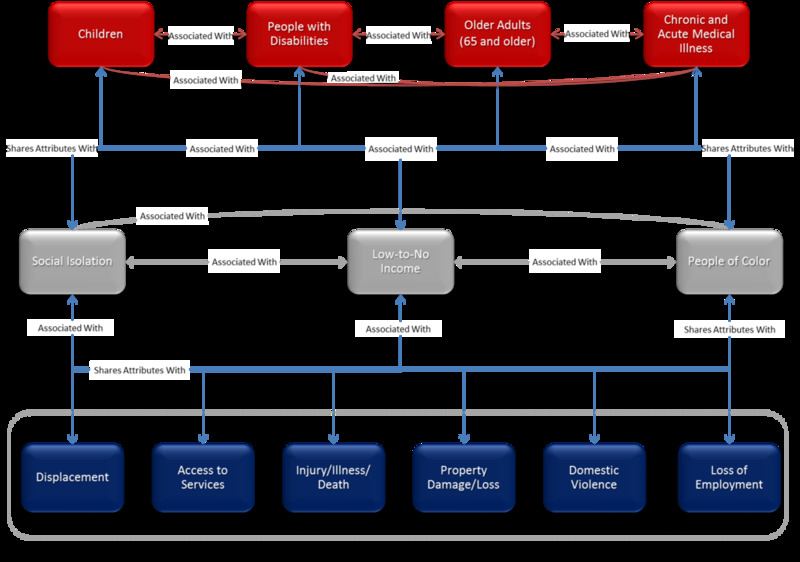 The Framework includes the specific poor outcomes that people with pre-emergency social factors are more likely to experience at a disproportionately higher level after emergencies: lack of access to post-incident services; displacement; injury, illness, and death; property loss or damage; domestic violence; and loss of employment. I applied the Social Determinants of Vulnerability Framework to the City of Boston to determine if the relationships between social factors of vulnerability are consistent with literature, to determine the areas of geographic concentrations of the most vulnerable people, and assess the relationship between social isolation and the other factors of social vulnerability. Based on a citywide geospatial analysis and neighborhood level correlation analyses, I also identified the most vulnerable people and neighborhoods.